I remember taking this photo. You were only 2 months old. I was on maternity leave. I was so focused on you. So in love with watching you. So in awe of the things you were starting to do. I took a million photos of you. We were sat in the front room. You resting on my lap. In a cute babygro with no legs. You loved having you legs free. You still prefer to not have cover. I was playing with a new app. Snapping away at this child that had grown in my belly. That made me feel so complete. That I loved so much in that instance. That I caught your yawn on camera. I sent the picture to daddy at work. 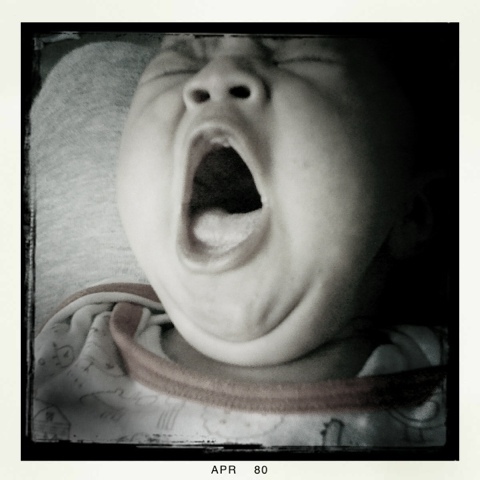 You still yawn like this now. This still looks like you.